COSTA MESA, Calif., Sept. 13, 2018 /PRNewswire/ -- Home insurer investments in improved digital interaction channels and bundled product offerings that combine multiple policies under one account are paying off in the form of the highest levels of customer satisfaction in the history of the study, according to the J.D. Power 2018 U.S. Home Insurance Study,SM released today. However, the ability of insurers to maintain these high levels of customer satisfaction will continue to be tested by the growing crop of "insurtech" start-ups capitalizing on digital-only offerings. "Despite experiencing record property losses due to severe hurricanes, floods and fires, home insurers have managed to win the hearts and minds of their customers through superior service and access to information," said Robert Lajdziak, Business Consultant for the North American Insurance Practice at J.D. Power. "But insurers should note that the preference for digital channel interaction has notably increased for several years, across all types of interactions and all generations of customers. That evolving consumer preference could provide an opening for digital-native insurtech companies." Record-high customer satisfaction: Overall customer satisfaction scores have reached an all-time high of 818 (on a 1,000-point scale) among homeowners (+10 points from 2017) and 839 among renters (+5 from 2017), driven by an increase in the proportion of customers who bundle policies and improvements in digital interaction channels. Preference for digital grows: Preference for using digital channels for interaction has increased significantly from 2017, across a wide range of interaction types ranging from payment verification and billing inquiries to policy renewals and price quotes. While the increased digital preference is evident in all generational groups of home insurance customers, it is most preferred by Gen Y1 and Gen Z homeowners. Benefits of bundling: Customers who have multiple policies with a single home insurer have higher satisfaction and are more likely to advocate on behalf of their carrier. Overall satisfaction among customers with six or more bundled insurance products averages 863, which is 111 points higher than among those who have just one home insurance product. Likewise, the average Net Promoter Score®2 among customers with six or more bundled products is 58, which is 52 points higher than among those who only have one home insurance product. Auto insurance represents bundling opportunity: While products related to the home, such as secondary residence insurance, umbrella policies, and valuable possessions insurance, are frequently bundled with home insurance policies, auto insurance remains an outlier. Presently, 20% of home insurance customers who also have auto insurance do not bundle their auto policy with a home policy, representing a growth opportunity for home insurers. Amica Mutual ranks highest in the homeowners insurance segment for a 17th consecutive year, with a score of 861. 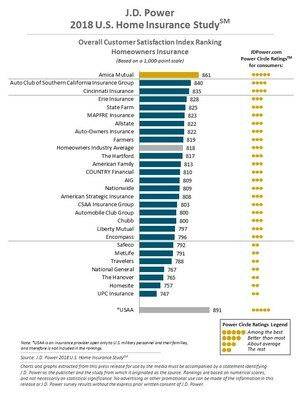 Auto Club of Southern California Insurance Group ranks second with a score of 840 and Cincinnati Insurance ranks third with a score of 835. 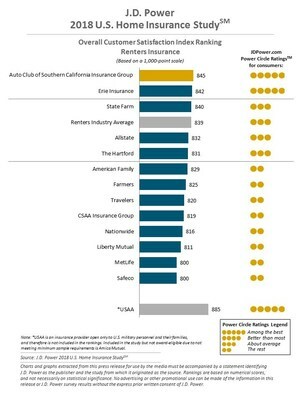 Auto Club of Southern California Insurance Group ranks highest in the renters insurance segment with a score of 845. Erie Insurance ranks second with a score of 842. State Farm ranks third with a score of 840. The U.S. Home Insurance Study examines overall customer satisfaction with two distinct personal insurance product lines: homeowners and renters. Satisfaction in the homeowners and renters insurance segments is measured by examining five factors: interaction; policy offerings; price; billing process and policy information; and claims. The study is based on responses from 14,122 homeowners and renters via online interviews conducted in June-July 2018. See the online press release at http://www.jdpower.com/pr-id/2018168. 1 J.D. Power defines generational groups as Pre-Boomers (born before 1946); Boomers (1946-1964); Gen X (1965-1976); Gen Y (1977-1994); and Gen Z (1995-2004). 2 Net Promoter,® Net Promoter System,® Net Promoter Score,® NPS® and the NPS-related emoticons are registered trademarks of Bain & Company, Inc., Fred Reichheld and Satmetrix Systems, Inc.